The defeat at Bristol City means QPR have lost five Championship matches in a row and taken just one point since the turn of the year. But it’s not all bad news. As well as an FA Cup fifth-round tie at home to Watford to look forward to, there are reasons to believe it’s only a matter of time before league results improve. The sudden, emphatic return to action of Grant Hall has been a definite positive for the R’s. Having spent so long out with knee trouble, the defender has completed three full matches in a week and looked strong and sharp. Hall believes his knee issues have now been resolved – and he certainly looks like he could play a major role for the rest of the season. The poor run QPR are enduring has involved some serious back luck and that surely has to change. Having been denied an incredible comeback by an injury-time penalty save in Saturday’s 4-3 defeat against Birmingham, there was more late penalty woe as Bristol City scored a last-gasp winner from the spot. 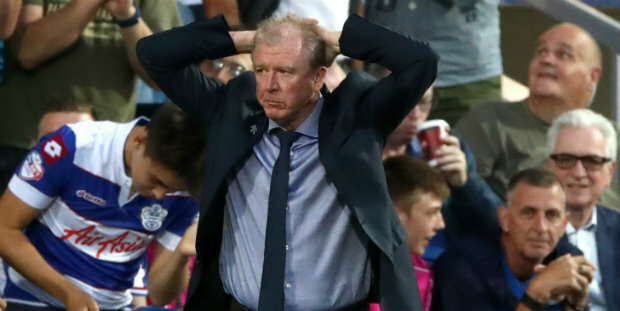 The decision to award a foul against Darnell Furlong was absolutely ludicrous and denied Steve McClaren’s side a point they more than deserved. The performance suggested wins are not far away. With Matt Smith making the most of his recall – his opener at Bristol City was his fourth goal in three games – and Tomer Hemed back from injury, Rangers suddenly have more options up front. They were doing well with Nahki Wells as their only out and out striker. With Geoff Cameron and Angel Rangel also on the way back from injury, the squad looks in good shape for the remainder of the campaign. And then theres the ref – what a plonker. How the hell can you play against 12 men? and we pick up another hefty fine for our trouble. I think the FA need to retrain most of them. Disallowing a perfectly good Bristol goal and then the ‘penalty’ yes, I know things balanced themselves out over the game, but these sort of basic errors should never have happened in the first place. ‘Looks good for the rest of the season’, but then what? another mediocre mid level season with yet more loanees followed by another average season? I really can’t see anything else next season. Only one bright light – loanees return and put in a shift maybe.